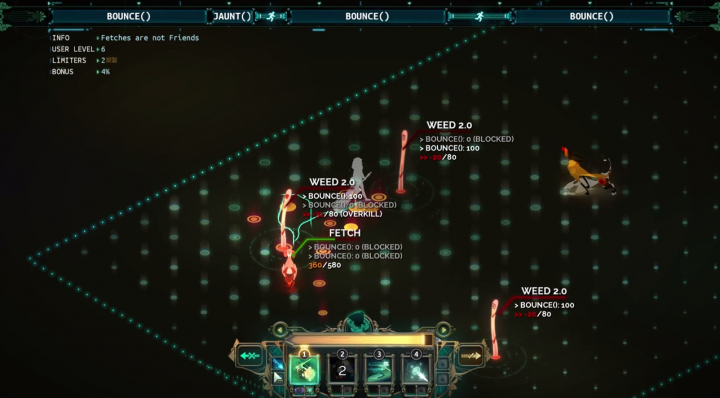 Like their previous work Bastion, Supergiant Games‘ brand of emergent narrative wonderfully ties excellent game mechanics to unlocking larger pieces of the plot’s puzzle. You’re dropped into the game with no idea what the world is like — a foreigner to the rules of its society and its systems. 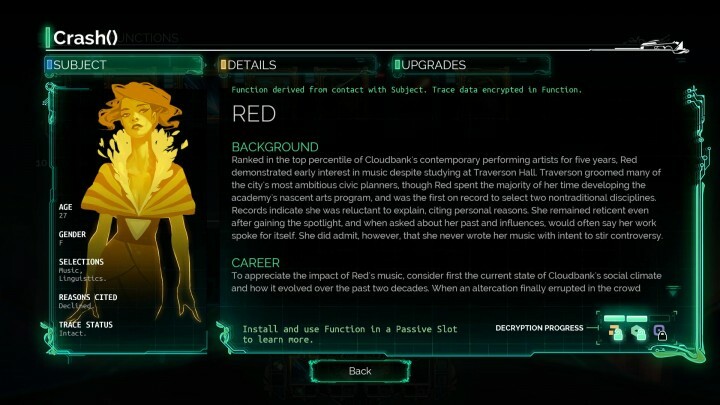 But just as the main character of Transistor, a singer simply named Red, is slowly uncovering her path, so are you. As Red improves her ability with the titular Transistor weapon, you parallel her gains in confidence with your own growing expertise in battle. You begin to feel what Red feels, pushed ever forward by her motivations. By the end of the roughly 5 hour adventure you are Red, exhausted and satisfied with the world you helped create. 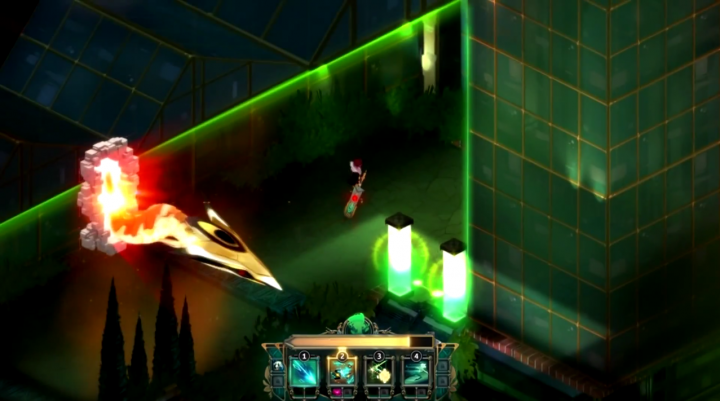 The game opens up with nothing more than a still image of the Transistor sword, embedded in an unknown man. That’s all the context given until you press a button, prompting the sword to speak (which it does frequently throughout the journey). “Hey Red, we’re not gonna get out of this are we?” There’s a moment to take in the world around you. The artwork is rich yet somber, the soundtrack heartfelt yet lonely. The sword seems unwieldy — heavy and cumbersome for Red’s small frame. You as the player are equally unsure of how to handle it as you explore the beginning area, simply spamming the crude Crash() attack to eliminate enemies. It’s uncertain why the enemies, collectively known as The Process, even exist or are hostile towards you. But Red keeps trudging through the post-apocalyptic city while unlocking new functions (the game’s name for combat skills) to increase her effectiveness. As you start to feel more empowered with each additional function, you also slowly uncover bits of the world and what happened as each one grants a short profile section about a citizen of Cloudbank. However, you can only unlock these profiles by utilizing each function within all of their roles: primary slot, secondary effect, and passive bonus. This not only encourages you to experiment with different gameplay combinations but also helps you settle into a unique flow tailored to your own preferred combat style. As you explore these options, the unlocked profile info coupled with the Transistor’s comments further invests you into why and how Cloudbank ended up like this. By the time you face off with the first boss, you don’t need anyone telling you why you need to win. You, as Red, want to. After killing hundreds of enemies, mastering a few functions, and racing across various set pieces the game really opens up. Optional equips called Limiters that restrict abilities and enhance enemies keep the gameplay fresh and pulse pounding. In the beginning, Transistor‘s combat played more like an isometric tactical RPG, with thoughtful decisions and frequent undos to maximize your turn damage. That style has now blended with flavors of arcade action as you instinctively make split second decisions while constantly dashing behind cover. That is until you meet The Spine. Midway through the game a colossal tailed creature starts to stalk you — by smashing everything in sight. What used to be welcome pauses between combat areas becomes filled with tension as you anticipate the next abrupt attack by The Spine. It even interrupts your normal combat flow as it disrupts your movement and offensive options with its presence, forcing you to rethink how to approach enemy placements you may have easily handled before. It’s exhilarating and crescendos to a climactic battle right before Red can reach her goal location. As for that goal, the best way to describe it would be anti-cathartic. It’s a unique take on boss battles that transfers the built up motivation to arrive there into propelling the story towards its final act. The game is now amped up to its maximum levels, throwing the toughest Process enemies at you with the bare minimum amount of cover terrain. It never feels unfair though, because Red now has access to the strongest functions in the game to wreak havok with. You’ll likely more than a few times come across the developer’s fun easter egg message if you do insane overkill damage to an opponent. Combo setups like activating stealth, debuffing an enemy to take 300%+ more damage, then backstabbing with an explosive uppercut can easily result in one-shot kills. However, if you do get into a situation that drains your HP to zero, it’s not the end. Transistor‘s death mechanic smartly gives you as many chances as you have primary functions equipped. If you have a skillbar setup with 4 functions and get “killed”, you now have 3 functions to complete the battle with. This lets you attempt to turn around a losing battle with some well-placed turn actions instead of simply throwing you back to the previous checkpoint. You recover your lost functions after reaching a couple of save points, which may have more than one battle in between. This is incentive throughout the game to really learn the combat system, since you don’t want Red to be crippled in every fight. At the very end of the game you’re able to put all of your skills to the test, culminating in an epic final boss that once again requires you to rethink your usual strategies. The payoff for winning is substantial yet bittersweet as the story reaches its last moments. It’s beautiful in its quietness, and you’re left staring at the screen soaking in the gorgeous ending song’s lyrics, chills running down your back. Storytelling in games has a huge variety of approaches, from the silent first person protagonist to text-heavy RPG epics. However, not many games like Transistor can weave narrative and characterization so tightly together with gameplay that you’re unable to disconnect from the world even long after the game ends.